How a lifetime of entrepreneurship and a firm foundation of faith shaped the first how-to guide for merging faith and financial freedom. In 2005, Marquita Miller put her feet to faith and jumped head first into the world of entrepreneurship. After working for Fortune 500 companies as an accountant for years, Miller knew her time to shine had arrived. The decision proved to be providential: Miller resigned from the corporate ladder and branched off into the world of small business ownership. During those first years, Miller relied on her faith to help her survive the trials and tribulations of beginning a small business. She shaped herself into more than just an entrepreneur—she became a Faithpreneur, a person who follows the path to entrepreneurship by first following the path to God. Today, Miller owns and operates Five Star Tax and Business Solutions from her headquarters in Kansas City, Missouri. Her tax service business focuses on a diverse menu of business solutions, including tax planning and preparation, accounting and payroll, startup planning, financial and performance evaluation planning, and revenue generation. From the business’ inception as a part-time hobby in 2009 to its current position as a local marketplace leader, Miller has sought to focus her services on small- and medium-sized businesses. Miller fosters entrepreneurship in others, and her business places special emphasis on services for startups. Miller’s business sense and commitment to her faith and values has catapulted her to the forefront of Kansas City’s booming tax service scene, and the community has taken notice. KC Business magazine named Miller as one of Kansas City’s 2010 Rising Stars and as one of the metro’s 2011 Influential Women, and Five Star Tax and Business Solutions has been nominated for Small Business of the Year in the metro. In addition to the honors, Five Star Tax and Business Solutions has been certified as a woman-owned and minority-owned business. A true entrepreneur, Miller is in the process of expanding her company into new markets across the United States. Miller holds a Bachelor’s of Science in accounting and management from Park University and a Master of Business Administration from the Keller Graduate School of Management. A Kansas City native, Miller has accomplished her dreams and beyond while also serving as a wife, mother, daughter, mentor, woman of God, active church leader, educator, speaker, radio show host and board member in multiple organizations. Miller has stretched the limits of time to complete her latest accomplishment as author of Faithpreneur: God is Not an Agent for Your Failure. For more information on Miller’s new book, Faithpreneur, or to see inside features the book offers, visit faithpreneur.net. To contact Marquita Miller for book signings, speaking engagements or to order copies of her new book, send email to info@faithpreneur.net. Founded initially by Marquita Miller as a part-time tax service business in 2000, Five Star Tax and Business Solutions has since evolved into a full-service accounting and business consultation firm. The firm has processed thousands of tax returns for small- and medium-sized businesses, consulted countless entrepreneurs on business formation, won numerous business growth awards and provided accounting services to dozens of organizations. In 2011, Kansas City, Missouri-based Five Star Tax and Business Solutions expanded its operations and opened an Overland Park, Kansas branch office. Miller plans to open new branch offices outside of the Kansas City metro in the next few years. For more information on Five Star Tax and Business Solutions and to learn how the company can help your business succeed, send an email to info@fivestartaxkc.com or visit the website at fivestartaxkc.com. In 2000, Miller founded Five Star Tax and Business Solutions as a part-time, home-based business while working as a faculty care liaison accountant for a local non-profit education organization in the Kansas City metro area. The company has since evolved into a full-service accounting and business consultation firm that has processed thousands of tax returns for small- and medium-sized businesses, consulted countless entrepreneurs on business formation and provided accounting services to dozens of organizations. In 2011, Kansas City, Missouri-based Five Star Tax and Business Solutions expanded its operations and opened an Overland Park, Kansas branch office. Miller plans to open new branch offices outside of the Kansas City metro in the next few years. Miller has extensive experience in the financial arena. Prior to founding Five Star Tax and Business Solutions, Miller served as a tax accountant in Black and Veatch’s Overland Park office, and later as a senior accountant for Commerce Bank. Miller first considered and then acted upon starting her own financial firm after several companies approached her to act as an independent contractor for their financial accounting affairs. She holds a Bachelor of Science degree in accounting and management from Park University and a Master of Business Administration from the Keller School of Management. Miller is also a certified First Step Fund instructor and coach, where she helps entrepreneurs plan business strategy and acquire start-up funds. Miller is currently pursuing CPA designation. Since founding of Five Star Tax and Business Services in 2000, Miller has received numerous awards and recognitions for her business acumen and entrepreneurial qualities. In 2005, the Greater Kansas City Chamber of Commerce selected Five Star Tax and Business Services to participate in the POWER program, which is dedicated to strengthening growing minority- and women-owned businesses. By 2006, Miller’s company was honored by the Kansas Black Chamber of Commerce for her involvement in and commitment to entrepreneurship development in her community. In 2007, the company was nominated as one of the top 25 small businesses in Kansas City by Small Business Monthly and as one of the top 100 small businesses by the Greater Kansas City Chamber of Commerce. Miller also serves as a board member for the National Pearl Society and for Running Back, Giving Back of the Kimble Anders Foundation. 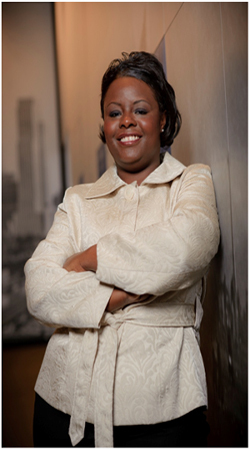 She is an advisory board member for multiple organizations. Miller has partnered with community colleges, trade schools and business schools to educate students in her program, “The Business Side of Business,” and she is currently developing a seminar program devoted to the principles of Faith First, Business Second.